Proper Auto Maintenance is Child's Play - AutoNetTV Media, Inc.
By Bobby Cannon ,Vice President of Sales, AutoNetTV Media, Inc. Anyone who has a child knows that it is a full-time job to watch after and care for them. My child just turned 15 months old and I am constantly reminded of that fact. I’m amazed at the attention and mindset required to watch after a child this age. 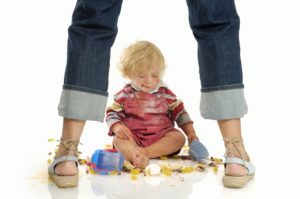 I say ‘mindset’ because many times, at least for me, it requires a change from child-observing to child-maintenance. Rather than reacting, you actually have to observe conditions and prepare for possible disasters. Case in point: the other evening while my wife and I were conversing and preparing dinner, our child, let’s call him Wildman, got into one of the cupboards within his reach. This seemed relatively harmless since I had already locked the cupboards that could pose a health hazard to him. However, I failed to have a proper child-maintenance mindset in that there could be other potential problems. In rummaging through the cupboard Wildman quickly found a container of sprinkles and decided to test the durability of the container by throwing it straight down against the tile. I can’t say what was more colorful, the floor or my wife’s language regarding my failing. What’s more, while my wife and I were preoccupied cleaning up the sprinkles and finishing dinner, Wildman found an open box of risotto and, instead of throwing it, simply turned the box upside down and a lovely waterfall of rice commenced all over the floor I just swept. This experience taught me an important lesson, aside from my little boy being a menace. Many facets of life require some form of a maintenance mindset – jobs, parenting, health. But few of us have this mentality when it comes to our vehicles. Too often we are reactionary to problems rather than seeking out those services that will not only prevent catastrophic failure but save us money down the road. But how do we do this? Aside from changing the oil every several thousand miles, most people know very little about their vehicle and its needs. Thankfully, we all don’t have to be experts when it comes to our vehicle needs. AutoNetTV produces content that educates consumers on the value of automotive service and repair. Whether using 3D animations, full-motion graphics or on-camera correspondents, these segments teach the benefits of these technical services and the advantage of having highly trained professionals perform them for you. Whether a vehicle needs a new timing belt, winter tires, or synthetic oil, AutoNetTV’s educational content explains to the customer, on their level, why maintenance is in their best interest. This programming has helped thousands of shops across North America educate their customers and helped improved their attitude towards service and repair. With that maintenance mindset, consumers can have safer commutes and avoid unnecessary costly repairs down the road and I won’t spend my evenings picking food off the floor.